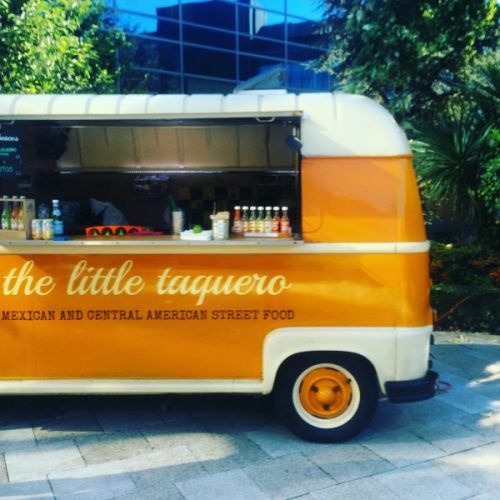 Fans of the Harbourside Market will no doubt recognise our Trader of the Month’s bright van and delicious offerings: it’s The Little Taquero. We got in touch with Chris, the husband behind the husband-and-wife team who run The Little Taquero and its delicious tacos, to find out how it all began. What was the idea behind The Little Taquero, and how did it get off the ground? Well in our previous life, before our business was born, Kerry and I both worked for an adventure travel company – it’s actually how we met. We managed to travel a fair bit while we were working there and I had a real fascination for Central America, constantly heading back there whenever the opportunity arose. I was also lucky enough to spend some time living with a family in Mexico on my way out to Oz, where I was going to live for a bit. I was completely blown away by the food and the difference between authentic Mexican food and what my understanding of Mexican food was before visiting the area. The street food revolution was well and truly taking off down under and I plotted my escape from my job, planning the little taquero with a vision of bringing authentic Mexican food back to the UK – unchanged. I met Kerry on a trip to Singapore and she provided the inspiration and encouragement to set up the food truck on our return to the UK. Tell us about how you make your food – from supply to serve. We aren’t fancy chefs and we don’t put our own spin on authentic dishes or change things for the Western palate – our concept is surprisingly simple; we learnt the recipes from the locals and then brought them back to the UK, unchanged and straight from the region. Hopefully that can be tasted in the food! We also make everything from scratch. The tortillas, the cornerstone of Mexican cooking, is something we were never willing to compromise on. We’ve pressed every single tortilla ourselves since we started in 2015 (I dread to think how many hours this equates to… thankfully and despite my gender, I can multitask and I’ve watched my fair share of TV series and films!). We spend hours in our kitchen marinading meats, preserving salsas, making our pico de gallo and slaws the morning of a trade to make sure they’re at their freshest and making our chunky guac on site. We source our produce locally and are lucky there’s an amazing Mexican shop in Clifton (called Otomi) for the more obscure Mexican ingredients. Who are some of your local food heroes? Ooh that’s a great question – Bristol is brimming with so much good food! We have big respect for those making everything themselves rather than buying in – you can taste the difference in the first mouthful! In the world of street food, we love Murray Mays and their flavoursome kebabs, Eatchu with their fresh gyoza and when we are hungover, we head straight to For Mice and Men for their grilled cheese. Bricks and water places that have particularly impressed recently are Wokyko at Wapping Wharf, Wallfish in Clifton and Birch in Southville. Do you have any big plans for 2018? What about 2022? We do indeed… (drum roll please): We are about to become the first Tortilleria in the South West. We are importing a tortilla machine from Mexico which not only means we’ll be able to speed up the time it takes us to make fresh tortillas for our taco truck but we’ll be able to supply the public and other outlets with fresh, gluten-free, corn tortillas. As for 4 years from now? Who knows ha ha! We’d love to convert another vehicle but if we did it would be to sell something different rather than more of the same. Churros? Empanadas? We might (probably / definitely) need another trip to the region for inspiration! What would your ideal Last Meal be? Steak…Steak and red wine… actually make that steak and red wine in Argentina…Yes!